The USA-grown sustainable Bedroom Collection at Earthsake is stunning & healthy. Each piece is uniquely scaled to fit the dimensions of the contemporary home. Entirely handcrafted in the USA from sustainably harvested forests on the Pacific Coast (USA) and finished with a natural linseed oil & wax finish! The Pacific Maple Bedroom Collection features natural light maple wood bedroom furniture custom-made by hand in the Pacific Northwest USA. The makers use time honored traditional craftsmanship and quality standards such as mortise & tenon joints and unbroken lines of solid wood construction. Now available in Pacific Cherry Wood as well. Choose from drop down menu when ordering. Made for customers who appreciate the difference of solid, hand crafted, heirloom quality furniture made in the USA with sustainable materials sourced in the USA but without the monetary or environmental cost. Sustainably harvested, produced, assembled and finished in the most natural way. 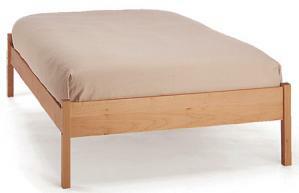 Additional Details/Specs: The simple low profile of this Classic Maple bed brings a touch of style to any decor. Hand made of solid Pacific Coast Maple grown in managed forests in Washington and Oregon. Each piece is hand-rubbed with a pure tung oil and beeswax finish to enhance its natural beauty. Pacific Maple Beds come with a sturdy platform of closely spaced slats attached with jute webbing and bolstered by a center beam (*center beam in all except twin beds). Available in both a slat frame option (no boxspring) or a boxpring frame option. Height of Platform 15 1/4″ 10"